Tickets are on sale now for King Kong at the Broadway Theatre in New York City. Officially authorized by the estate of Merian C. Cooper (Creator of "King Kong" and director of the 1933 film), the musical adaptation is based on the novel of the original 1933 screenplay. It features a book by Jack Thorne - the Tony and Olivier Award-winning writer of Harry Potter and the Cursed Child - a score by Marius de Vries - a Grammy Award winner whose previous credits include "La La Land," "Romeo + Juliet," and "Moulin Rouge!" - and songs by Australian Heplmann Award-winning performer Eddie Perfect. 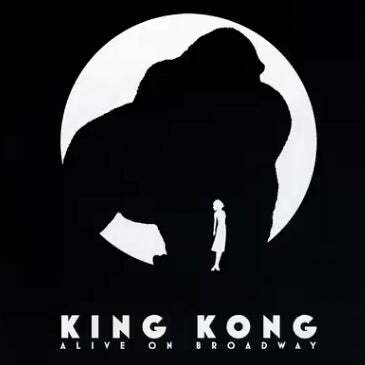 Following its monstrous, thrice-extended world premiere from May 28, 2013 through to February 16, 2014 at the Regent Theatre, in Melbourne, Austrailia, Kong once again returns to the streets of Manhattan, where the production officially opened at the Broadway Theatre on November 8, 2018. From the opening number, King Kong sets its intentions clear. It is a theatrical spectacle with stunning visuals, courtesy of the gigantic LED screen that merges seemlessly with parts of the set. Director Drew McOnie also sets the tone and pace with relentless choreography that accompanies and accentuates the action as we are introduced to our leading lady, Ann Darrow. She is a modern re-working and no longer the damsel-in-distress we have all grown accustomed to through previous iconic portrayals. She is feisty and fearless and longs to make her mark, belting out her first number "Queen of New York" as if part of a Destiny's Child concert.. And then, later in the show, we finally meet her co-star. Making his grand entrance, initially just the whites of his menacing teeth and eyes are visible in the darkness at the back of the stage, and when Kong strides into the light this six-metre tall, two-tonne, animatronic puppet is truly a great wonder of the world to behold. Operated by around a dozen, ninja-like puppeteers (known as The King’s Company), Kong is a marvel of stagecraft and technology. Kudos to Global Creatures for raising the bar for technical possibilities in live theatre. Although King Kong is marketed on pure spectacle, there are also some touching moments on stage. Ann's connection to Kong is that of a woman who longs for her voice to be heard and a misunderstood creature who has no voice. Her "Full Moon Lullaby" is a beautiful musical moment that binds two characters together and in later scenes, as Kong sits exploited in chains in the concrete jungle, the emotion in his facial expressions and body language is so surprisingly palpable. King Kong and New York City go together like a horse and carriage and witnessing Kong run rampage through the streets of Manhattan and scale the Empire State Building in this epic musical is a sight theatre fans will surely never forget. Based on the 1932 novel, the stage production of King Kong is a contemporary take on the classic tale of Beauty and the Beast. The story follows a young actress and a maverick filmmaker as they voyage from the bustling streets of 1930s New York to an uncharted island to capture the greatest wonder the world has ever seen. King Kong is a larger-than-life encounter with a legend that’s always been too big to contain. 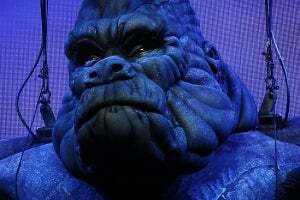 King Kong has extended its booking period at the Broadway Theatre, with performances now scheduled through to September 1, 2019. The cast of King Kong includes Christiani Pitts (as Ann Darrow), Eric William Morris (as Carl Denham), and Erik Lochtefield (as Lumpy). "Ladies and gentlemen, seeing is believing..." and now prodcuers Global Creatures and Roy Furman have announced the dates when audiences will be able to witness Kong's "return" to the Great White Way. 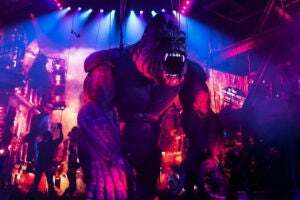 The long-awaited Broadway premiere of King Kong will officially open at the Broadway Theatre on November 8, 2018, following previews from October 5.